If you look around this website, you will see several references to me fishing fly rod spoons. I'll begin by saying, I'm still learning! Several folks have complained about not being successful with the fly rod spoons. A fly rod spoon is the Daiwa Vega .4 gram spoon. When I talk about fly rod spoons that is what I am referring to. Like many people I know, my knowledge of spoon fishing was minimal up to about a year ago. My fondest memory of fishing with a spoon was when at the age of 14 we were trolling spoons behind a boat in a high lake in Wyoming. The trout were slamming spoons! I cast large spoons for Muskies in Minnesota. Trolled Dare Devils for Northern Pike. That is about it! A year ago or so, Chris starts touting the Diawa Vega .4 gram spoons. I bought three just to check them out. My first experience was dismal. I caught no fish, I thought it was a joke to attempt to use a spoon on a fixed line. The spoon just rode the top of the moving water in the riffles. The only thing I knew about spoons was to make them wiggle. Pulling them straight in didn't result in much action! So after three tries the fly rod spoons just took up space in the box. Soon I began seeing fish caught on them on this website. I saw Chris was sold-out and couldn't get them. I was on a binge of checking out Japanese Area fishing on YouTube. I then realized somehow these things catch fish! So, last spring I was fishing the ultra-light worm method and broke off at Wilson Springs. I wasn't ready to stop fishing, so I put on a fly rod spoon (gold), and tossed into the current. The spoon swung into the calmer water, and Wham! My first fish on a fly rod spoon. I tossed the fly rod spoon into the current of the eddy that was coming toward me, and slowly kept the spoon fluttering about 2 feet below the surface, and Wham!, my second fish on a fly rod spoon. Hummm, I guess these things do work. So, I asked myself the question, "How can I make the lightness of these spoons work to my advantage?" So here is what I have learned so far. I fish them upstream as much as possible, and manipulate them as they drift toward me. I normally fish with a 3 foot leader of 6.5x fluorocarbon and a Tairiki Snap. The Tairiki Snap allows you to change spoons quickly, and I think they give more flutter. My favorite line is a 3.5 level line. My favorite rod for fly rod spoons is the TenkaraBum 40. If I want to go longer, it is the Suntech Fine Power 56. The lightness of the spoons lends itself to simply casting to a suspected holding lair or a fish you see the same way you would cast a fly. However, let it flutter down. Like all Tenkara, you want to keep the line off the water, but a nice bow in the line gives the flutter, and when the line goes straight, set the hook! If I don't get a hit right away, I like to porpoise the fly in. I generally don't lift it all the way to the surface, but just up to where I see it and the drop the rod about 3 feet, letting it flutter down again. Last week I was on my last porpoise less than 3 feet from me, and a trout slammed the spoon at a 90 degree angle. Rather than trying to fight the fish at such a poor angle, I let him run with light tension on the line until he had to fight on my terms. The next technique is what I call the "wounded minnow." This works best in no current or a mild current. Have you ever seen a small fish or minnow that was struggling? This has several variations. The easiest is simply jerking the spoon a few times after it has settled a little, but never in the same direction. This mimics a struggling minnow. The second method is to dip the rod and make a half circle of 6 inches to 2 feet. This will give the spoon a whirling affect. The last wounded minnow technique is what I call the "half arc," It works OK with the TenkaraBum 40, but awesomely with the Fine Power 56! Look left and then right, where is the current of your arc the least. You have to be creative with this one, because there is no perfect water. The idea is to cast and let the fly rod spoon sink. You want to fish the rod as close to the water as you can and then sweep the rod from left to right or right to left, working the spoon in a haphazard fashion imitating a minnow looking for shelter. The circle can be small to big depending on the water. A wounded or exhausted minnow seeks cover. So don't be afraid to let the spoon settle on the bottom. Flutter the spoon up and down in a pool also imitates a wounded minnow. 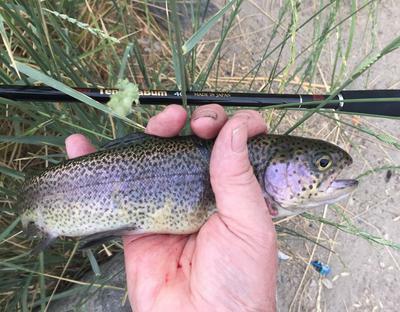 If you get a hit while fishing your spoon in the current or a seam, but miss the fish, treat it like a wounded minnow and drop the rod 6-12 inches imitating that the fish wounded the minnow and often the trout will turn and slam the spoon! I am guilty of wanting to see the flash of the spoon too. It doesn't matter if I see it, it does matter if the fish sees the spoon as food! I talk about Wilson Springs a lot. It is convenient and a great place to experiment. It has fast, medium, slow, and calm water. So here are a few more techniques, I have been using recently. I am not afraid to use split shot. You might be thinking "Oh, he is making up the lightness of the spoons with shot!" No, no, no. I use a split shot to create a hinge. Ninety percent of the time when using split shot, I am using a #10 Dinsmore split shot. A #10 Dinsmore weighs only .06 grams. You don't even feel it on the line, but what it does is delay the affect of your line when you lift it on the fly rod spoon. Just think, as you lift the rod and the line, it has to meet the resistance of the split shot before it affects the spoon. You want to keep your spoon down longer, hinge your line with a #10 Dinsmore split shot. I never go bigger than a size 6 shot. There is one spot in one of the pools where I can watch the hinge affect. I was fishing with no shot, and as the fish cruised by and I manipulated the spoon, it was moving up the water column too fast. I put on a #10 Dinsmore shot. I dropped the spoon to the bottom in the same spot, and waited for the cruising fish to come by again. I manipulated the spoon pretty much the same way as before, but the #10 Dinsmore's hinge delayed the rise, and it was not only slammed by the number 2 fish in the pod, 3 other fish went after it. In fact, the lead fish did a radical turn and tried to steal "the minnow" from the fish that was hooked. That is the advantage of fishing in a clear huge spring with polarized glasses. How do you pick a spoon? I usually start with a silver or a gold spoon. If I don't have much action, I will go with a darker spoon. I have now been asking myself, what do the small fish look like where I am fishing? I'm not going to tell you what color to use. It does matter, but not as much as presentation. This summer I didn't have to go much beyond a silver or gold. This winter, I am finding the darker colors are proving to be more productive. Many of the smaller fish in my area are drab green or brown. These spoons work well. Switching spoons often gives me a renewed optimism, so again having the snap makes it easy. However, multiple switching just for the sake of switching isn't going to catch you more fish! Where I fish on the Boise in the winter is a great catfish spot in the summer. A black spoon gets slammed by the trout this time of year. Last weekend, I caught two Mountain Whitefish on spoons. That was thrilling. My last bit of advice, fish them like you would a streamer. I am still learning. I am having so much fun with this light spoons, I would encourage you to work through the learning curve. Seeing fish chase your lure is fun. Having fish dart across a pool to slam your spoon is a lesson in patience! I will confess, I have set the hook too soon, pulling the spoon away from the fish. It sure has added a fun new element to my fishing! Thanks for the tutorial! I have been mildly curious about the spoons since seeing them on this site. You break down the various methods into simplistic terms that even I can understand. Another order coming for Chris! 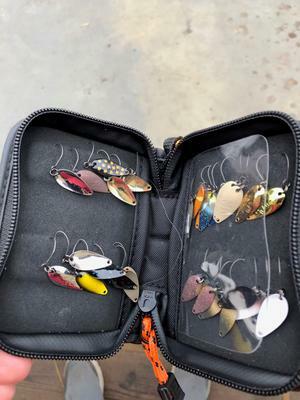 I’ve been almost exclusively fishing fly spoons on my Traveler 270, fishing them as a jig or spinner. They draw a lot of strikes (for me anyway) and I have witnessed fish slash at a falling spoon, miss, and turn to strike it again. Dragging the spoon just fast enough to get the blade to spin, letting it free fall, and jigging it seem to generate the best results. They work great for me. Many years ago, a co-worker and friend, that was mainly a bass fisherman, asked me to go fishing with him. We got off work at 3:30 PM, and it took about 45 minuets to drive up to the large irrigation lake we were to fish. The lake is set in a fair sized river canyon, in oak and wild oats savanna grasslands that is pretty rugged in places. The soil is made up of mostly of red clay and decomposed granite (sand in other words), with granite slabs and rock out crops mainly in the seasonal stream gullies, so the lake bed is a very sterile place due to all of the above factors in addition to the dry Mediterranean climate and water out flow for irrigating the farm land in the San Joaquin Valley of California. It was in the fall, so we had to hike quite a ways to get down to the water. When the lake was constructed they took out all the trees, leaving only the stumps behind. Consequently, there is almost no brush, fallen timber, cattails or natural aquatic weed growth. But because the lake has a prolific Threadfin Shad population, the bass do well and reach respectable size. I started setting up my fly tackle, which took a while. Larry, was better prepared to fish than I was, with the ugliest black primer spray painted 6 Ft. bait casting rod and Push-button, Closed-face Spinning Reel (also spray painted the same dull black) that I had ever seen, which he explained was to keep from spooking the wary bass that live in the crystal clear spring waters of some stock ponds that he has access to in the foot hills. The rod was already strung. He pushed the reel’s button and untied the 10 Lb. clear nylon line from the star drag on the reel, then he tied on a size #6 Worm Hook. Taking a rubber worm (plastic or who knows what?) out of his tackle pack, he threaded the hook point through the front of the worm for a half an inch or so, then out the side of the worm, then pulled the worm’s front over the hook’s eye, turned the hook 180 degrees and sticking the point back in the worm to just beyond the barb, making a weed-less lure for missing all the weeds and brush that were not there, which didn’t make any sense to me. Most of the shiny chrome plated hook was showing in full view of any fish that might decide to take the worm. Then, about 18 inches above the worm, Larry clamped on a split-shot. And a second ½" diameter split-shot another 10 to 12 inches above the first one. Larry lobbed out a short cast and checked the action of the worm in the water, pulsing it with the rod and taking in the slack with the reel as the worm moved toward him. Lifting the rod caused each split-shot to move in opposing directions, with the worm moving in the opposite direction from the split-shot closest to it. The worm swam very erratically, both in an up and down and side to side motions. I was totally amazed at how life-like the action of the worm was in the water. The next cast was a fishing cast, across the narrow inlet of a stream gully, with Larry hopping the worm down the stair-stepped under water erosion section of the lake’s bed on the other side of the cove. Going across the bottom of the creek channel toward our side, Larry Said, "I have a fish on". Then he pushed the push-button on his reel and pulled out two arm-lengths of line. Then he raised the rod tip to pull the slack line out through the rod guides with out putting any pressure on the line going to the fish. He let the fish continue swimming, lowering the rod tip until the fish took out enough line to bring the rod tip down to the water, then Larry struck the fish with a Lets-Rip-Some-Lips-Kind-Of-Strike, and the fight was on. How Larry knew a bass had taken his worm is a complete mystery to me. I believe you (Les) ought to give the two split-shot technique a try and see how it alters the behavior of a Mini-Spoon. Unlike the silted–up muddy water we were fishing that evening, you ought to be able to see your trout take your lure. Good Luck and tight lines…Karl. Thanks for the great report/tutorial Les. I rarely fish with spoons on spinning gear and never with a tenkara setup but you have awoken my curiosity!